The music game developer says it is grateful for all the help that Viacom gave it, but is excited to be striking out on its own again. Just weeks after putting the music game developer up for sale, Viacom has found someone who wants to take Harmonix of its hands, and despite names like EA and Activision buzzing round, Harmonix has not become the plaything of a big publisher. Instead, Harmonix's new owner is Harmonix-SBE Holdings LLC, an affiliate of investment management company Columbus Nova. 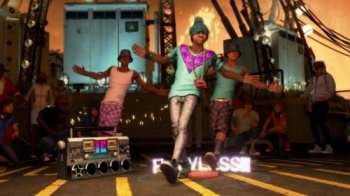 This move makes Harmonix a privately owned, independent studio, as it was before Viacom purchased it in 2006. Neither company has disclosed the value of the sale. Writing on the Rock Band website, Harmonix's John Drake said that Viacom had been a great home for the developer for the last four years, and thanked everyone at the company who had worked with Harmonix in making games like Rock Band and Dance Central possible. Drake said that very little would change from the consumers' point of view, and that Harmonix would continue to support its previously released titles as it had always done. He also said that Harmonix had a few unannounced projects it was working on that he thought people would be very excited about.